Three other players retired on the same day (which is the end of the financial year in Japan). 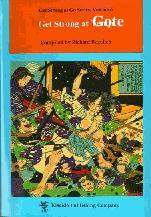 They included Haruyama Isamu 9P, known in the West for his frequent instruction tours and for co-authoring a classic Ishi Press/Kiseido book Basic Techniques of Go. The British Online League’s fifth season opened on March 22. Eighteen teams of three players each, loosely organized geographically, will compete in three divisions through the end of the year in the “British Room” on KGS. The league was established in October 2009 to encourage interaction between players in different areas of the country and online play among members of the British Go Association (BGA), though only team captains need be members. There is a prize for the winning team in each division, funded from entry fees. The first division winner, which last season was Edinburgh, also holds the GoGoD Shield and each player in that team wins a GoGoD disk as part of their prize. The league is organized by John Collins on behalf of the BGA. Leading go publishers are releasing a number of exciting new books that already seem destined to be classics in the field. Go Seigen’s 1-1 Point Modern Opening Strategy has just been published by Slate & Shell, based on a manuscript that had been thought lost for years. “Go’s deep but straightforward analysis of the power of the 1-1 point opening may well revolutionize opening theory,” says S&S. Adding to their legendary “Get Strong” series, Kiseido is offering Get Strong at Gote, which “explores the subtle strength of refusing to take sente.” In a related volume, Kiseido is re-releasing The Art of Aji Keshi, long out of print but back by popular demand “for players who want to master the ability of eliminating absolutely all play in a given situation.” From Yutopian comes a pair of books for players looking to make the jump to the next level. Making Bad Shape and All About Heaviness are “encyclopedic references no serious go player will want to be without,” promises Yutopian. Finally, SmartGo Books is releasing four brand-new books by the prolific 9-dan professional Michael Redmond — How To Die In Gote, The Joy Of Being Thick, The Wrong Direction and 21 Kyu in 21 Days – in 14 different apps and online platforms. A 50% discount is being offered on all the books above in a special 1-day offer that expires at midnight on April 1. Paris is lovely in the springtime and especially so for go players, with the 41th Paris International Go Tournament taking place this weekend at the Lycée Louis Le Grand. With over 200 players are already registered, the 3-day tournament is one of the largest go events in Europe and is set for March 30 through April 1; click here for details and to register. Fans can also follow top-board action on KGS and on EuroGoTV. 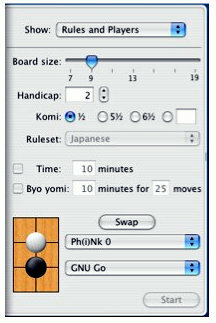 Registration is still open for this weekend’s KGS 2013 Meijin tournament qualifier, which is once again sponsored by SmartGo. The February qualifier featured “many exciting games and drew more than 350 observers,” reports KGS admin Akane Negishi. The single-elimination qualifier will be held March 30-31 on an Asian/European daytime schedule (Round 1 starts at 6a EDT/3a PDT). Click here for details and to register; deadline is March 30 10:03a (GMT). The go9dan.com game this Saturday between Lee Sedol 9P and Gansheng Shi 1P has been postponed “while we move go9dan’s main server to Hong Kong this weekend,” reports Michael Simon. The match will likely be rescheduled for Saturday, April 13 at 10p. Lee is 7-0 in the AGA-Europe Pro vs. Sedol 10-Game Series. “The Spring Go Expo has something for everyone,” said organizer Michael Fodera as he announced the opening of the 2013 Spring Go Expo at Harvard University’s Student Organization Center at Hillel last weekend. And so it did. Spread out across four connected areas in a student lounge, the Expo featured exciting performances, thoughtful presentations from a scholarly perspective and an exclusive 15-minute segment of the upcoming documentary film The Surrounding Game. 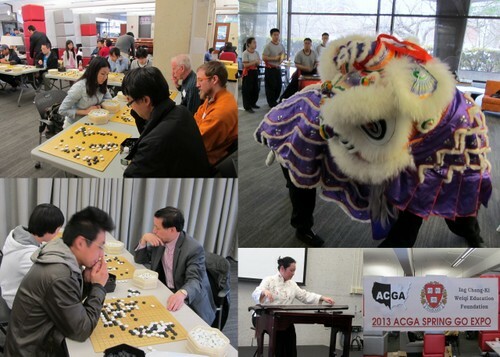 The event was organized by The American Collegiate Go Association (ACGA) and the Harvard University Go Club and sponsored by the Ing Chang-ki Weiqi Association. And for those who wanted it, there was plenty “real go,” with a self-paired tournament, plenty of space for casual play and simultaneous play with top players ranging from Ing Cup winner Chang Hao 9P to America’s newly minted pros Andy Liu 1P and Gangsheng Shi 1P. Narumi Osawa 4P, a Japanese pro currently touring the US, and US-based Chinese 1P Stephanie Yin also made generous use of their time, joining the others in simultaneous play and instruction. Mid-level players also had the opportunity to play Chinese National University Champion John Xiao and American 7-dan Ben Lockhart. The first round of simuls began at 9a on Saturday. “Many go events focus on tournament play, but we also wanted to include teaching, and exposure to other aspects of Asian life,” Fodera continued. “Go is considered one of the ‘Four Accomplishments’ in China, so let’s learn more about the others,” he said, yielding the stage to Shin Yi-yang, an accomplished player of the qin. Meanwhile, calligraphers from The Chinese Culture Connection demonstrated their art, and drummers from The Rhode Island Kung Fu Club chased a large dragon throughout the space as attendees enjoyed a free lunch. While self-paired and casual games continued, filmmakers Cole Pruitt and Will Lockhart presented a 15-minute of their exciting documentary scheduled for release later this year. After a lecture by Prof. Elywn Berlekamp on “Coupon Go,” Liu played an exhibition game against Hao, losing by only 3.5 points. On Sunday, while younger players competed in a Youth Tournament, more than 50 participants played and recorded games that were then analyzed in small groups by the professionals. Peter Schumer reprised his college go course talk from this year’s International Go Symposium. 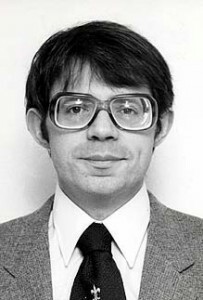 (click here to view Schumer’s Symposium talk), and Thomas Wolf described his work studying “The Mathematics of Seki.” Pruitt, Lockhart, Fodera and all the ACGA organizers can take pride in a job in a job well done and extended grateful thanks to the Shanghai Ing Foundation, especially its director, Lu Wen Zhen, and the Secretary General, Ni Yaoliang, who traveled from Shanghai to attend the event. In an ironic showdown between the computer and ‘The Computer’, computer go program Crazy Stone defeated Ishida Yoshio 9P on March 20 at the sixth annual Computer Go UEC Cup in Japan. Ishida, 64, was nicknamed ‘The Computer’ in his prime, because of the accuracy of his counting and endgame skills. Rémi Coulum’s program took just four stones against the former Honinbo champion and won by 2.5 points. 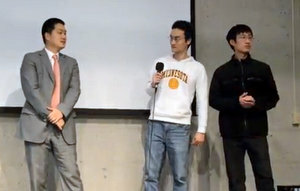 After the game, Ishida said he thought Crazy Stone was a “genius,” evincing special admiration for the program’s “calmness” and “flexibility.” Takao Shinji 9P also offered words of praise, calling one of the program’s moves “the kind of move a human would overlook.” UEC chairperson Takeshi Ito expressed his hope that the UEC Cup will continue to “function as a place where program developers can meet face-to-face and make technological changes,” adding that “we should never forget the human being using the programs to play the game.” Rather than seeing computer go advancement as another competition, Takeshi said he believes computer go program technology “should be useful for and able to enrich the hearts of human beings.” Coulom and Crazy Stone also won the 6th Computer Go UEC Cup a week earlier, defeating the defending champion, Zen. For game records and more information about the Ishida-Crazy Stone match, click here.